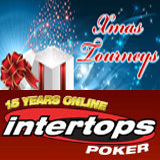 After the gifts have been unwrapped and the turkey is reduced to leftovers, Intertops Poker has a full schedule of Christmas poker tournaments to keep the festivities going. Bounty, free roll and guaranteed tournaments begin Christmas day and continue throughout the week. A 50% (up to $300) reload bonus is also available until next Wednesday.